Fear, trepidation, and separation anxiety; these are some of the feelings I experienced when my partner Susan “suggested” we trade in our luxurious diesel pusher motorhome for something smaller. I have been an avid RVer since I was a young boy. My parents would often take my siblings and I camping, and when I was in my very early teens, my father took a 6-month sabbatical so we could travel across North America in a motorhome. I am certain it was that event which caused me to become addicted to the RV lifestyle. After attaining my first university degree, I decided my measure of success would be ownership of a large Class A motorhome. My most recent unit was a Newmar Dutch Star diesel pusher. It had plenty of space, comfort, and amenities, and was my material pride and joy. Susan felt a smaller vehicle would be a better investment, but given that I had become accustomed to the size and space of Class A’s, I was highly skeptical. Nonetheless, because Susan is always right, I agreed to go shopping. On a cloudy Saturday, we drove to the same dealership where I had purchased the Dutch Star in search of a smaller ride. I had never before made a direct comparison between the ultimate luxury of Class A diesel motorhomes and their smaller van counterparts. The van that we ultimately decided to buy has all the comforts of the Dutch Star, just on a smaller scale. It is a perfect vehicle for just the two of us. Susan wisely commented that we should embrace the closeness forced upon us in the van. The biggest advantage to the smaller vehicle, and one that I did not expect, was the spontaneity and frequency with which we use it and how much local sightseeing we do in it. We take the van out almost every weekend in the spring, summer, and fall, and even use it on regular day trips. Most surprisingly, we have explored many local parks and locations that we never would have seen in the big RV. Some of these places are within our own city, while others are a little further away. I experienced none of the feelings I expressed at the beginning of this article as we drove our new van off the lot. We still have our comfortable bed, entertainment center, kitchen, and washroom, just on a smaller scale. Since we are both shorter than 5’8”, the scaling factor is not an issue and I am now a convert to the virtues of travelling in a small RV. 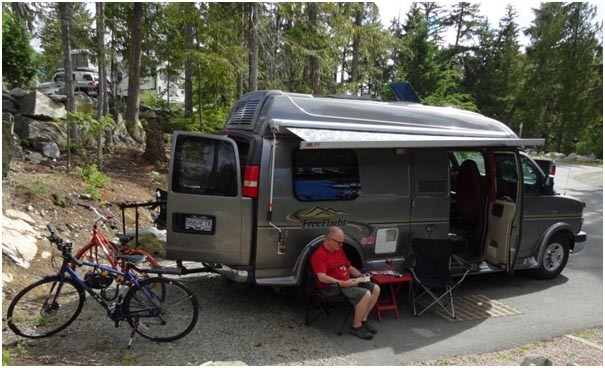 Coach-Net members who own smaller motorhomes are part of the increasing population of RVers who recognize the value of these units. Prior to making the change, I had a long list of reasons not to do it, but it was only after purchasing the van that I fully realized the many benefits. In addition to being physically closer, we spend more time on the road, both locally and afar, appreciating our beautiful province of British Columbia. With the large RV, a great deal of our time was spent inside the rig. Now we enjoy the great outdoors much more often, and frequently cook our meals outside. Sales of smaller RV’s, especially vans, is on the increase, and I know that our future RVs will be Class B units. I encourage all motorized RV owners to consider smaller units next time they are shopping for a new home on wheels for two. *Images within the body content were provided by and used with permission from the author.